A bicycle wall mount helps you save space, and store your bike even in a compact area. It will let you hang your bike on the wall when not in use, a perfect set up when you have a smaller garage. 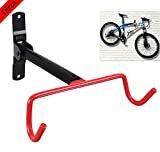 Do not let the bike storage be a problem and get you the best bike wall mounts 2019. We have the list of the best for you easily choose which one will satisfy your need in the bike wall mounts. Bike parking space is not a problem anymore. This Foldable bike wall mount from Auwey is an ultimate space saver. It needs only a simple installation, just pre-drilled the holes where you preferred to attach the mount, tighten the screws, and you can now have your very own bike wall mount. The wall mount has two rubbery-coated hooks to protect your bike from scratches and secured locking mechanism to avoid accidental release. Instead of holding the rim of the bike, this strong and durable bike wall mount holds the frame. You can now store your bike vertically for easily retrieve it when you need your bike, and just fold the mount when your bike is in use. Save up some space with the adjustable bike wall mount from the coastal provision. It can handle any types of bike frames since it can be adjusted to support any bike frame’s style and size, and the hooks are foldable to clear up space when not in use. Install a bike wall mount as an indoor and outdoor storage it is suitable for both. Constructed from 100% solid steel to proved maximum durability, this bike wall mount is rugged and sturdy. It can hold all sizes of bicycles like the mountain and street bikes. The soft rubber coat is to protect the bike frame from scratches and avoid sliding the bike. 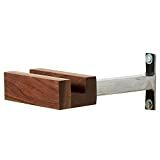 Highly recommended to install in wood stud, but you can install to any concrete wall too, just avoid dry and chipped walls. 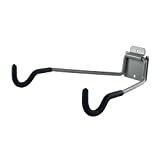 This wall mounts from Venzo is a pedal wall mount, that means it holds the pedal to hang the bicycle at the wall. It is an ideal item to keep the bike mounted at the wall and save some floor space. It has 3 pedal wall mounts, which allow you to stack 3 bicycles, it will make the bike perfectly horizontal in a 45-degree angle that allows you to stack 2-3 bikes. The pedal hook is lower than the usual bike hook; it is safer, and perfect for storing and displaying. This will also avoid scratching the body of the bike since it only holds the pedal, and this bike wall mount can fit any size and type of pedals of any bike. The package includes 3 pieces of wall mounts, screws, and anchors. If you are a minimalist, this bike wall mount from Play-Haus design is perfect for your taste. Constructed with solid salvage wood and heavy-duty steel, you can assure that your bike is safely hanged when not in use. The bike wall mount is handmade from Cleveland, and it is a perfect addition to your decoration at home. There are 2 sizes to choose from, the 1.5″ and 2″, depending on the size of your frame. You must attach the wall mount on a wall stud, or else it cannot hold the weight of the bike. In the package, the tools and instruction are included, and the steel is coated to avoid rust. You can hang your bike horizontally and vertically depending on your style. It holds the frame 9″ from the wall. This bike wall mounts hanger from Dirza will help you save some space in your garage where you park your bicycle. This item will let you hang your bike to save some space on the floor; you can even use it indoor to display your bike. Make sure that you mount this on cement or stud wall. When you use the bike, you can fold the hanger to save space, and avoid people in bumping into the hanger. The padded hanger is to protect your bike from damages and scratches. The rack weights 3lbs and can lift up to 38 lb, and the hanger can fit any size of bikes. This is not the typical bike wall mount that holds the frame of the bike to hang it to the wall, but this one holds the wheel with a fixed hook vertically to save up some space to smaller areas. It has a load capacity of 66lbs and has a product dimension of 10.2″ x 3.2″, while the black color adds some sturdy look. 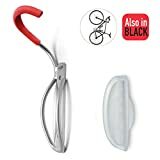 The product is made from a military grade steel material and the hook is covered with soft rubber to prevent slipping and scratching the mounted bike. The bike wall mount is suitable for all types of bikes like road bikes, mountain bikes, folding bikes, and many more. The weight capacity will still depend on where you will install the wall mount. Secure your bike while hanging on the wall with the bike wall mount from Reliancer. It a support up to 35lbs, but still depends on how strong the wall is. The wide rubber is to protect your wheels from scratches, while the protective tire trays will protect your wall from tire marks both front and rear. It is a complete space saver since it is foldable and has a dimension of 3.54″x 1.25″x 14.2″. When it comes to installation, it is very easy to install and the drilling template and screws are included in the package. 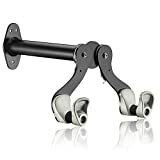 Start saving some floor space with this best bike wall mounts from Reliancer. You can hang your bike to save some ground space or display it, whatever the reason this bike wall mounts from PHUNAYA has is one of the trustworthy when it comes to wall mounting bikes. Hang on our bike when not in use, and hang off when you need to ride. Hang it horizontal or vertical whichever suits your style is suitable in this mount. Each package includes the best bike wall mount and screws with spare for each set in case of some mistakes. The folding design is to keep the arms out of the way, in when the bike is not mounted; with this holder, you can save more space. Although it holds the body to hang, your frame is safe since the arms are covered with soft rubber to protect the bike pain from any damages. It can hold a bike that weighs up to 68 lbs, and suitable for most type of bike frames. This product is durable and strong, but make sure that you install it in a strong wall or stud. A stylish bike wall mounts from Delta Cycle is this Leonardo Da Vinci rack. It holds the bike on its wheel to hang it vertically. There is no assembly required, just an easy wall installation. A Da Vinci wall tray is also included to keep your surface clean and protected especially after riding, specks of dirt are all over your wheels and you do not want that on your wall. The rubber sleeves that hold the wheel is to protect the bike from scratches, and for additional grip to avoid slipping. This bike wall mount can accommodate any size of wheels and with a maximum load of 40lbs. Even without the bike, these hooks will still look good so if you are planning for attaching this indoor, it will look great. Store your bike without getting too much space by mounting it using the 75-ST6016 from Stalwart. Instead of parking it in the garage or indoor that can be a hurdle some time, but mounting it can save you floor space, and it can be a perfect decoration on your wall too. 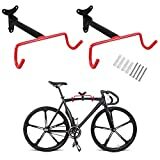 Made from solid sturdy steel with soft Ethylene-vinyl acetate foam-coated hooks, this bike wall mount will secure your bike frame from scratches and sliding. 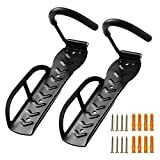 It is compatible with the most type of bicycles, and this will help you to keep your bike inside your home and make it handy and always ready to ride. It has a dimension of 13.25″ x 11.6″ x 4″ and can hold up to 50lbs. When you are using the bike, you can fold the arms to get out of the way to avoid bumping to it that can cause damages and accidents. If you like, your bike mounted vertical, this heavy-duty bike rack from Dirza is the right one for you. There is no complicated assembly needed, but only a simple installation. The fixed hook allows you to hang and remove the bike within a second, and ensure that your bike is safe mounted when not in use since it holds the wheel of the bike. A great investment and a good space saver at your home and garage. The hook covered with rubber to protect your rim from scratches. The maximum hanging weight is up to 65lbs, depending on where you will attach the wall mount and a tire tray for the front with a non-slip stripe to secure your bike from slipping. Take note that this is not compatible with electric-bike and bikes with fat tires. The bike wall mounts from Ibera is the best bike wall mounts 2019 because it is the best among the rest. The frame holder is adjustable to keep your bike level at all times. Specifically designed for horizontal mounting of single bikes to save floor space. This item has a weight limit of 39.6lbs. Do not install this on drywall or plasterboard to avoid having any problems. The strong and durable wall mount is made of aluminum, and the hangers padded with ABS to keep your bike secure and protected from paint damages. This is suitable for most of the bike frames since the hanger beam length is adjustable that can fit wide and narrow handlebars. Getting a bike wall mounts can save you a lot of floor space especially if you own not just one bike. Wall mounts are useful, and it can add some attraction to your garage and even inside your home. Our goal is to give you the best products in the market that is why we ensure that all items on our list are the top-notch items in the market.